If your'e in the market for Broadheads and Bands, we have a variety to choose from. What we have done at Rhine Valley is that we have talked to several Hunters to determine what they use, then we have tried to stock those Brands, If you have a particular Brand that you would like for us to keep in stock, please feel free to let us know. Carbon Express Quad Pro "Lung Buster"
Carbon Express Qud Pro "Lung Buster" Broadheads. 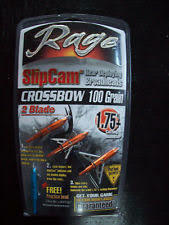 Rage "Slip Cam Broadheads 100 Grain. Muzzy (SGH) Small Game Broadheads. Rage Crossbow 100 Grain Broadheads. Rage Crossbow X 125 Grain Broadheads.